For the longest I never really cared what I put on my face. As long as the packaging was cute, and I could afford it, why not give it a go? But then ... (O.o)... then I got my first wrinkle. Well it was more like I got 2 at the same time. Actually to be honest, I didn't notice that I had a wrinkle until the lady at the counter (Body Bar @ Tropicana City Mall) told me I had two. So of course I freaked. I freaked and bought a whole bunch of stuff. And that was when I fell into the organic movement trap. So much fun to play with! Comes in a brown paste form! I love the smell of rose and mint. 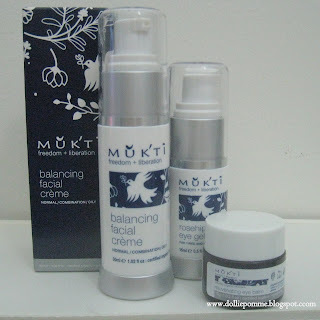 Up until a week ago my face was 'totally' organic (for about 2 months) with me using a range of Mukti & Remedica (Australian) products which I was quite obsessed with. Them being all organic and stuff. "Was" being a key word here, it's safe to say that I am semi over it. Now that was quite oxy-moronish, lol. Admittedly going organic (0nly on my face) was a frantic phase in life for me. I had just started a new job and was sleeping late nights and working late hours. This new lifestyle gave me my first two wrinkles (yep, I would stare and stare and count them over and over again), aka crowfeet, and after a week at my new job I began to look like Ling Ling the panda. So when the promise of no more wrinkles and panda eye pads was offered, I grabbed it up . So was I happy with my new organic products? Yes very. Until my face turned to the oily side of the force. Who knew organic didn't mean perfect for the skin? Because the word organic always brought forth words like "natural", "gentle", "pure", "organic"; that's why lah. But true to form (and the advise of my friends) I began to notice subtle changes in my skin because essential oils are dangerous and may be too strong for some. So totally one kind. Misleading would be the other kind. But I think I know where the problem began though. The (ever so fun to play with) Anago paste! The problem being that I ignored my instincts the first time round and gave total trust to the lady at the counter; cause she knew what she was talking about mahhh. So I had tried the Anago face wash for a week and had noticed that every single time after I had rinsed and dried off my face, then I would be all itchy (on my face la). Then I would quickly spray on the Remedica toner (which I love - cause it's got mint in it!) and my face would calm down. At first the lady at the counter claimed that I was using too much on my face, but even after I cut down the amount I placed on my face, it still itched. But I went on ignoring it and kept using it for two months. Why? Cause it really is fun to play with. That's where the problem started. The Anago paste as it turns out dried out my skin, forcing my skin to manufactor more oil then my face actually needed. Therefore I have been left with oily skin that has been breaking out for the past two weeks. 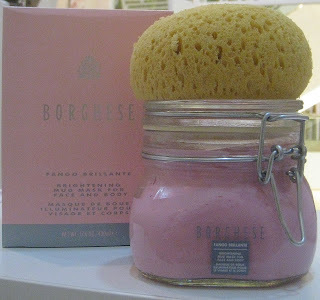 So to make myself feel better (and to try and do something about the increase of oil production), and also because I was nuts the other day, I bought some pink mud (Borghese Fango Brillante Brightening Mud) to try! Its pink! And its mud! Said to kick out sad, tired, dull skin and bring in a less tired me (fingers crossed), this pink mud from Borghese will also help to even out and even fire some of my hardworking workers at the oil factory. Yay! Why not give it a go right? Plus it comes with a sponge. A sponge! A sponge! It's sooo cute! Works on face and body too! It's so "pepto bismol" cute. Seriously, its pink mud. I'll try it out for a month before I come to any conclusions about it though. But for now I have to say it's the cutest pepto bismol pink mud I have ever, ever seen. Plus I love how light and delicate it's fragrance is. I really do feel soooo spoilt when I play with this product. And so far that would be 2 times. Hehehe. I likie. Oh and P.S incase y'all were wondering what I did with the 3 bottles of Mukti balancing creme, 2 tubs of Anago Facial wash, 1 eye balm, and 1 rosehip eye gel ... \(>.<)/ .. Ya la I know la, alot of money wei... Well I'm planning to give it to my mama. I am guessing she won't mind the extra moisture lor. Muahahahaha. But I may keep a tub of the left of Anago (1st tub I bought - still have wan) for trips. They are sooo useful when you put them into smaller bottles and take em around with your in your purse. Especially when you realize at the rest stop on the highway that the soap they have ... isn't really soap..just weird white.. slimey .. eeee.. you get my drift. So hai lor. Not total waste! Ok, ok, I'll stop adding to this post. I am Princess of Verbal Diarrhea! And i gotta know how the pink mud performs. I used to see the green but pink is new to me!